Tuner slot 1 DVB-S2x DUAL (DVB-S2X Support) tuner. 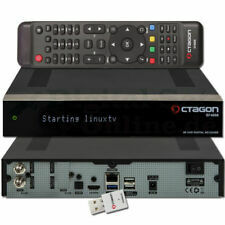 Tuner slot 2 - DVB-S2x DUAL (DVB-S2X Support) (Optional) or DVB-C / T2 DUAL (Optional). A receiver with 2x tuner plug`n`play with support for the new standard DVB-S2x, with a USB 3.0 port, Gigabit LAN interface, HEVC265 video decoding wants to open new prospects for the full spectrum of new 4K experience to enjoy. Tuner is equipped with the new standard DVB-S2X. DVB-S2X 4K UHD & Multistream. DVB-S2X Single Tuner. PIP HD & UHD (Picture in Picture). H.265 4K UHD DVB-S2X Tuner LNB Input. DVB-S2X: Silabs Si2166-D60 & RDA5815m. DVB-S2X 4K UHD & Multistream. H.265 HEVC 4K UHD DVB-S2X Tuner LNB Input. DVB-S2X & DVB-C / T2 combo (2x tuner). H.265 HEVC HD DVB-C / T2 tuner input. PIP HD & UHD (Picture in Picture). DVB-S2X: Silabs Si2166-D60 & RDA5815m. Tuner slot 1 DVB-S2x DUAL (DVB-S2X Support) tuner - Included. Tuner slot 2 - DVB-S2x DUAL (DVB-S2X Support) Not Included or DVB-C / T2 DUAL - Included. A receiver with 2x tuner plug`n`play with support for the new standard DVB-S2x, with a USB 3.0 port, Gigabit LAN interface, HEVC265 video decoding wants to open new prospects for the full spectrum of new 4K experience to enjoy. The device is only 11cm x 11cm x 2cm small. In this context, the end user is afforded an unsurpassed ease of use. Stalker & Xtream TV. IPTV m3u, m3u8, m3u8 plus, Autoget m3u. WebTV & VOD Video Club. Ab Werk ist das beliebte Linux E2 Betriebssystem installiert. - DVB-S2X 4K UHD & Multistream. - DVB-S2X Single Tuner (Silabs Si2166-D60 & RDA5815m). 1x H.265 4K UHD DVB-S2X Tuner LNB Eingang. - PIP HD & UHD (Bild in Bild). Die Tuner sind mit dem neuen Standart DVB-S2x, DVB-C und DVB-T2 HD ausgestattet. - WiFi eingebaut, 300Mbit, 2x Wlan-Antennen. - DVB-S2X 4K UHD & Multistream. - DVB-S2X & DVB-C/T2 Combo (2xTuner). - WiFi 2x Wlan-Antennen. 1x DVB-S2X Dual-Tuner (2x DVB-S2X). DVB-S2X Tuner Support. HDMI Kabel. 2x Plug and Play Tuner Slot. 2x 1700MHz Dual Core (2x 1,7GHz). Dolby S-PDIF. 1x HDMI 2.0 Anschluss. 2x USB 2.0 Anschlüsse. Stalker, Kodi (XBMC), Xtream IPTV. H.265 HD DVB-S2 tuner LNB input. H.265 DVB-S2 HD Multistream with a blind tuner and blind scan complete the product.As well as a card reader Conax. 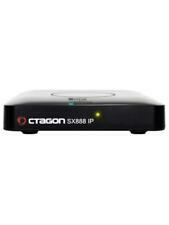 H.265 / MPEG4 - HD / SD, DVB-S2 Multistream Tuner. Ab Werk ist das beliebte Linux E2 Betriebssystem installiert. 150 Mbit WLan Stick mit Antenne. - DVB-S2X 4K UHD & Multistream. - DVB-S2X Single Tuner (Silabs Si2166-D60 & RDA5815m). 1x H.265 4K UHD DVB-S2X Tuner LNB Eingang. 300Mbit Wlan eingebaut, 2x Wlan Antennen. - DVB-S2X 4K UHD & Multistream. - DVB-S2X & DVB-C/T2 Combo (2x Tuner). 1x AV Audio Video Buchse Klinke zu RCA. 1x H.265 HEVC 4K UHD DVB-S2X Tuner LNB Eingang. 1x Fernbedienung. 3x Tunerauswahl in den Varianten mit dem neuen Standart DVB-S2x, DVB-C und DVB-T2 HD, sowie auch USB 3.0 Port. - CI Modulschacht. - DVB-S2x DUAL (DVB-S2X Support) Tuner. 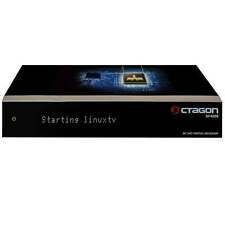 - DVB-C/T2 DUAL. Ab Werk ist das beliebte Linux E2 Betriebssystem installiert. 150 Mbit WLan Stick mini. - DVB-S2X 4K UHD & Multistream. - DVB-S2X Single Tuner (Silabs Si2166-D60 & RDA5815m). 1x H.265 4K UHD DVB-S2X Tuner LNB Eingang. !!! TV Halterung GRATIS !!! Dadurch lässt sich der Receiver ideal in Nischen verstecken, während Sie dank des Displays weiterhin die volle Kontrolle über die ausgewählten Sender usw. Netzteil (Stromversorung). HD DVB-S2 Tuner LNB Eingang. Ab Werk ist das beliebte Linux E2 Betriebssystem installiert. 600 Mbit WLan Stick mini. - DVB-S2X 4K UHD & Multistream. - DVB-S2X Single Tuner (Silabs Si2166-D60 & RDA5815m). 1x H.265 4K UHD DVB-S2X Tuner LNB Eingang. 4x Programmierbare Tasten auf der Fernbedienung. - Digital Audio Buchse. - Netzwerk 10/100Mbit LAN. - AV – Audio Video Buchse – Klinke zu RCA. - Netzwerk 10/100Mbit Anschluss. H.265 DVB-S2 HD Multistream mit einem starkem Tuner und Hardware Blindsuche (Blindscan) runden das Produkt ab. The device is small only 11cm x 11cm x 2cm. In this context, an unbeatable convenient use is allows the end user. Condition is New. -H. 265 HEVC HD processor. 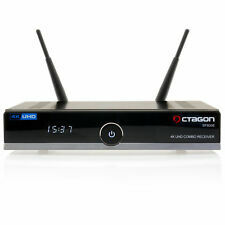 -H. 265 HEVC HD IPTV set-top box. 2 years manufacturers warranty, easiest iptv box in the world, accepts RT5370 chip wifi apapter if you wish to use on wifi system. HDD SATA2.5" 1TB 7200RPM/32MB WD10JPLX WDC. The DVB-S2X is suitable for SAT reception, the tuner is installed in Slot B, but only DVB-S2X can be used (hardware restriction of the receiver, in Slot A the tuner is recognized as 2x DVB-SX). The DVB-C / T2 is suitable for cable or DVB-T2 reception, the tuner is installed in slot B, however, only 1 DVB-C / T2 can be used (hardware restriction of the receiver, in slot A the tuner is as 2x DVB-C / T2 detected). Tuner slot 1 DVB-S2x DUAL (DVB-S2X Support) tuner - Included. Tuner slot 2 - DVB-S2x DUAL (DVB-S2X Support) or DVB-C / T2 DUAL - Not Included. A receiver with 2x tuner plug`n`play with support for the new standard DVB-S2x, with a USB 3.0 port, Gigabit LAN interface, HEVC265 video decoding wants to open new prospects for the full spectrum of new 4K experience to enjoy. Das Gerät ist nur 12cm x 2,5cm x 8cm klein. Natürlich kann man ihn trotzdem auch sichtbar plazieren. Ein Hingucker ist er trotzdem! - 4x Programmierbare Tasten auf der Fernbedienung. - Netzwerk 10/100Mbit LAN. HDMI Kabel (HDTV, HDMI, USB, Digital Audio, AV-Out, Ext IR, LAN, H.265, Youtube, Stalker, Kodi, Internetradio). - 4x Programmierbare Tasten auf der Fernbedienung. - IR Sensor (Infrarot Empfänger). - AV - Audio Video Buchse - Klinke zu RCA. Trending at $66.06eBay determines this price through a machine learned model of the product's sale prices within the last 90 days. HDMI Kabel (HDTV, HDMI, USB, Digital Audio, AV-Out, Ext IR, LAN, H.265, Youtube, Stalker, Internetradio). Anschließen und sofort loslegen! - 4x Programmierbare Tasten auf der Fernbedienung. - IR Sensor (Infrarot Empfänger). HDMI Kabel (HDTV, HDMI, USB, Digital Audio, AV-Out, Ext IR, LAN, H.265, Youtube, Stalker, Internetradio). - 4x Programmierbare Tasten auf der Fernbedienung. - IR Sensor (Infrarot Empfänger). - AV - Audio Video Buchse - Klinke zu RCA. DVB-S2x DUAL Tuner. 2 x Plug and Play Tuner input. 260 x 135 x 45mm. With 4x rubber feet. HDMI 2.0 connector. 2 x USB 2.0 connection. DVB-S2X standard support. Dolby S-PDIF input. Ustym 4K PRO UHD. H.265 HEVC 4K UHD DVB-S2X Tuner LNB Input. H.265 HEVC HD DVB-C / T2 tuner input. 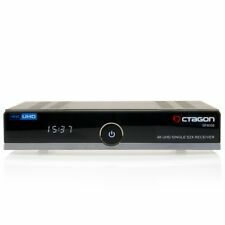 Ustym 4K PRO set top box receiver. DVB-S2X 4K UHD & Multistream. PIP HD & UHD (Picture in Picture). DVB-S2X & DVB-C / T2 combo (2x tuner).